In a recent game matchmaking chose two Maus tanks in our side. I guess this may happened because they both came in a platoon from the start. Imao that caused a terrible mismatching that ended up against us very soon as you can imagine. I think that as a flaw. Your opinions? 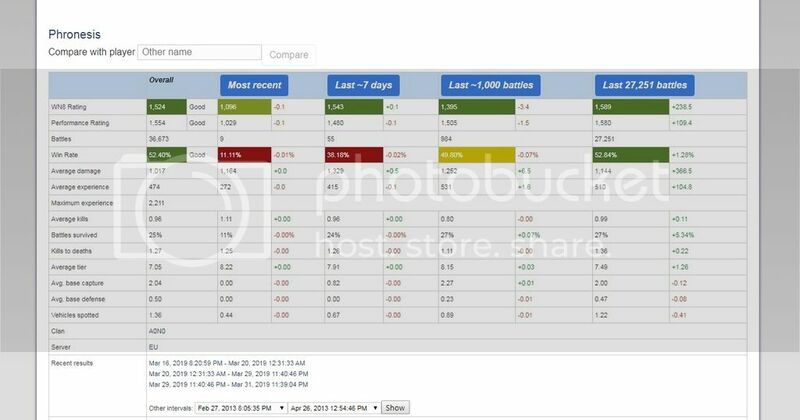 Looking at those results, maybe the problem for your team wasn't the two Mice, but the TDs and arties doing 0 damage each. This was a 4 minute fight on Ensk, with arties getting spotted trying to cross the rails? 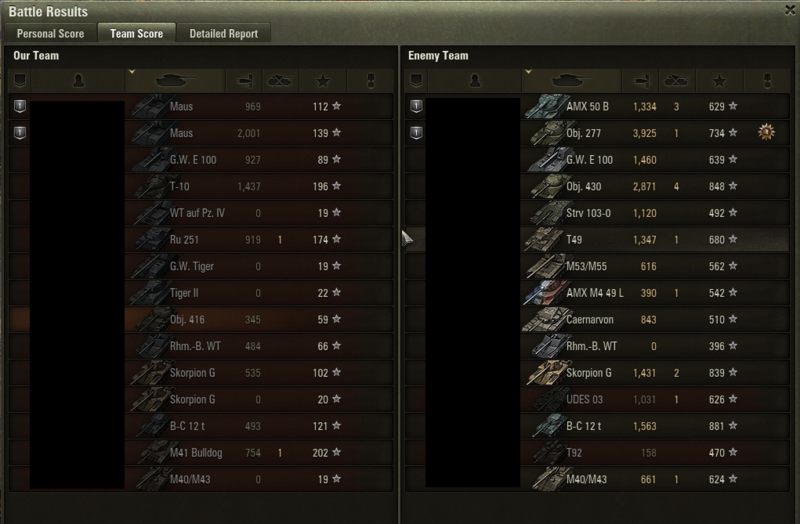 From what i can see you got to be on an epic fail team, they are pretty common in WOT. Nothing wrong with MM, a Maus should overall be much better to have on your team than AMX. Depends on what map you got. But overall I suspect it was not down to your Maus platoon looking at the scores. But I'm gonna venture a guess that their HT's went the med lane with most of their team's guns and flanked around killing off your tier 8 meds with little effort rather fast and boxed the rest of your team in, as the Maus platoon can't react fast to that. The Maus is a solid piece of tank to have on your side, it has high armour, high hitpoints, and these sides, decent firepower. Its main problem is it may arrive a bit late to the fight. Your matchup put your Mice platoon against an Object 277, which is a very solid tank if played well, and an AMX50B which... isn't, really, it's powercrept completely. In any evenly skilled matchup I'd put my money on the Mice any day of the week. However if your entire team gets wiped out and the Mice are left alone against overwhelming numbers which may happen in a steamroll, not even the fact that they would outperform a 277/AMX50B combo otherwise will save them. Matchmaker these days tries to take total hp into account so the Mice platoon may have reduced the choice for the rest of the team by picking tanks with lower hp totals, but platooning can skew this mechanism significantly and the matchmaker will allow for a large hitpoint difference if it means generating a match more quickly. That said, hitpoints are your last, not your first, line of defense and people should be conservative with them. In a team matchup such as this, people should've been patient and used the Mice as shields or gone to a flank where they wouldn't meet the enemy top tier heavies, fighting against their own equals. Fact is five of your players died dealing 0 damage and there's no good reason why that should've happened. My guess is they took up wrong positions at the start of the game, or your team gave up map control really early by going lemming or ignoring critical early positions. If there's a matchmaker problem here it's because one side got unlucky and got most of the poorly skilled players, not because something happened with tank stats due to a Maus platoon. I don't disagree, "epic fail teams" is pretty common and yes, sure, to have a Maus at your side could be an asset but I think that a major factor to balance this usual anarchist mob with tanks every day's normality is to offer more sophisticated power startup on both sides. Two slo-mo beasts in pair both at one side of murovanka cannot turn the tide. The best they could get was to end up dead last. My point is: One leading team of Maus Vs another leading team of AMX 50B & obj. 277. Does this MM looks balanced? More or less this is all about: Getting unlucky. Patience is a rare commodity in games like this. The map was murovanka encounter with the team split about 50-50 from the beginning.